Tor enables users to surf the Internet, chat and send instant messages anonymously, and is used by a wide variety of people for both Licit and Illicit purposes. Tor has, for example, been used by criminals enterprises, Hacktivism groups, and law enforcement agencies at cross purposes, sometimes simultaneously. This Perl Script enables you to directly route all your traffic from your computer to the Tor Network through which you can surf the Internet Anonymously without having to worry about being tracked or traced back. After that navigate to nipe directory and type “cpan install Switch JSON LWP::UserAgent” in same terminal which will install all other dependencies. To check the status of nipe, type “perl nipe.pl status” which you can see that, the current status is disabled. 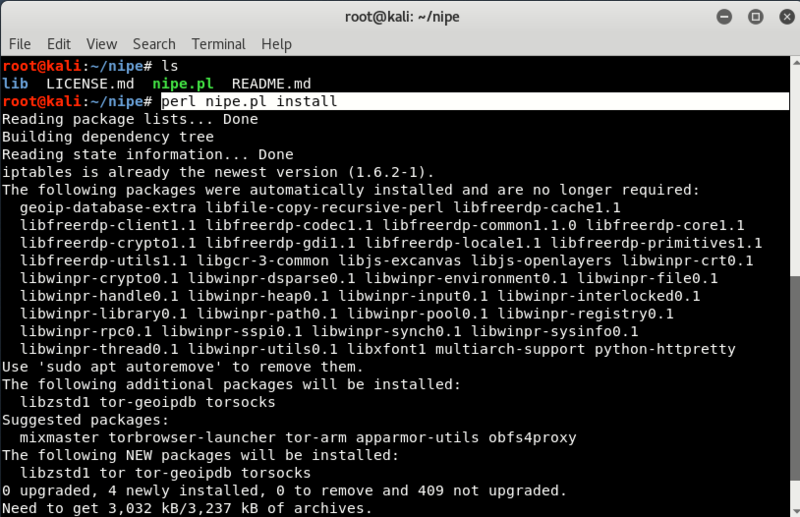 To start this service, type “perl nipe.pl start” and then check the status, you’ll get a new Anonymous IP instantly which you can further confirm through “curl ipinfo.io/ip” command.